For the record, Maurizio Cattelan is an artist who I actually do like. He has built an amazing career and reputation as quite possibly the only artist considered a prankster while remaining well-respected. Looking back on his oeuvre over the last 27 years, none of his art has necessarily been easy to swallow and as a white male, tongue shoved firmly in his cheek, I’m pretty sure that is exactly how he wants it to be. In late November 2011 through January 2012 he had a cumulative exhibition at the Guggenheim Museum titled “Maurizio Cattelan: All,” wherein literally nearly all of his artwork spanning his entire career was loaned to the museum and hung in the center of the rotunda at various heights. It was a feat to behold and while works were removed from their original context, this new, over-the-top conglomeration brought attention not only to the physical mass that had been assembled over the years, but also found a way of categorically removing its value. The show was intended to be a farewell to the art world, a ‘hanging’ if you will. However, as of September 2016, he is once again exhibiting at the Guggenheim, this time contributing “America” a solid gold, functioning toilet. This leads us to a comparison, calculating the weight of a commercial, porcelain American Standard toilet to that of gold —assuming that the weight could be somewhat similar— with an allowance for experimental error. That being said, the price of gold currently is $32.23 per gram. An average commercial toilet, similar to what Cattelan has replaced in the Guggenheim is 59 pounds. Therefore the production cost of “America” when doing a gram to pound conversion is roughly $862,539.00. You’ve read that correctly, the technical weight per material value is nearly a million dollars and that’s not including labor or artist fee assuming that there was one. If there is any reason to come out of retirement, I guess this is it. 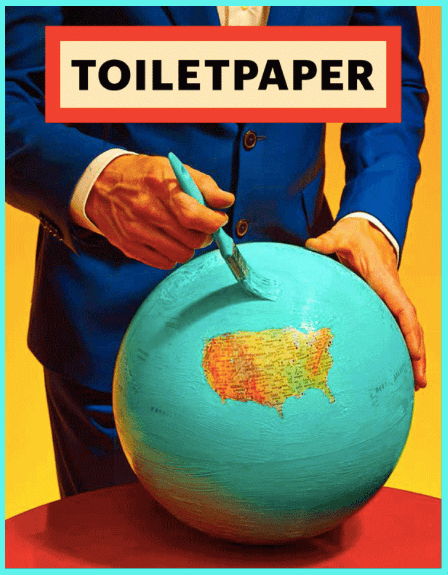 Aesthetically, the material use of a toilet is not out of left field for Maurizio Cattelan. In 2009 he founded the text-less, image heavy magazine Toiletpaper with photographer Pierpaolo Ferrari. It is glossy and the photographs large, filling each page, mostly in still-life format and without any true didactic narrative. Released twice a year the magazine has somewhat of a cult following. The duo have also shot and art directed images for fashion house Kenzo, T Magazine, Wallpaper and others. They have a very particular visual approach, making work meant to be two-dimensional but with a dynamic result that is both absurd and politically charged. One issue that could easily be argued in favor of “America” is that art, specifically within the realm of a museum quality sculpture, is costly to produce. This is something we all know and can rationalize according to what the piece says about the time in which it’s been made. Discovery through a work of art is instinctive, if not always immediately evident. A historic thread exists, tied between an artwork viewed in the present transporting the viewer to the time in which it was made. This could be as far back as centuries or just months prior. Similar to discovering a fossil, it will inform the future about the present. In this contentious political climate, I can’t help but wonder if this was the best time to install this sculpture, now on permanent display in one of the single person lavatories in the rotunda of the Guggenheim. Lest we forget: Donald Trump is running for president. Some may note that a functional, solid gold toilet may in fact be the perfect artistic antidote or response to a self-declared billionaire running for the highest political office in the United States. Inarguably, money dominates politics, the entertainment industry and yes, the art market. A troublesome issue I have with the piece is that the title, “America,” shrinks possibility rather than allowing space for pride in a larger nationalistic context in what happens to be a crucial moment. Maurizio Cattelan is an Italian artist living in New York who has benefitted 100% from the consumerism of the United States. He will not be able to vote in the 2016 election, yet has enabled the possibility for hundreds of thousands of Americans and tourists alike to urinate and defecate in an 18 carat gold bowl, the concept of luxury in the lowest common denominator. 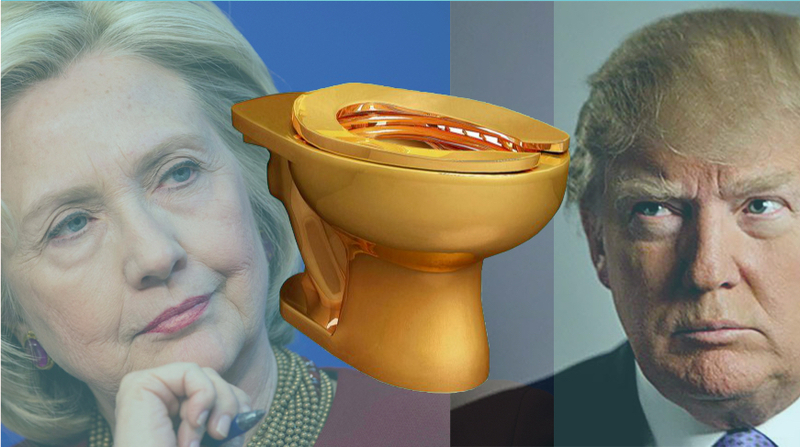 On the afternoon of the commencement of the first presidential debate between Hillary Clinton and Donald Trump I find this toilet, a step backward, a waste of resources and a joke made by the perfect artist to say it, at exactly the wrong time. I will always believe in art, and America, I still believe in you. Politics are not perfect but if we don’t have faith, we may as well all move to Italy, but with one of the worst economies outside of tourism, they want to move here. Support for Maurizio Cattelan: “America” was provided by Stefan Edlis and Gael Neeson, Wendy Fisher, Marian Goodman Gallery, Dakis and Lietta Joannou, Svetlana Kuzmicheva-Uspenskaya and Alexey Kuzmichev, Galerie Perrotin, Beth Swofford, and Dasha Zhukova.